Tendonitis of the flexor hallucis longus is an unusual source of ankle pain, but it is frequently seen in ballet dancers. Typically ballet dancers will complain of pain in the posterior aspect of the ankle. Here is more information on FHL tendonitis. A sports medicine physician can often make this diagnosis by palpating the flexor hallucis longus tendon as it passes behind the medial malleolus just inside the Achilles tendon. Often motion of the big toe can also reproduce the athlete’s pain. X-rays are often unremarkable, but they can show a large bony process called the os trigonum. An MRI scan can show inflammation of the flexor hallucis longus tendon. Typically the treatment is nonsurgical, emphasizing stretching, anti-inflammatory medications, physical therapy, and even a night splint. Often rest from dancing and immobilizing the tendon are adequate to alleviate symptoms. Occasionally intractable pain in dancers can require surgical treatment. 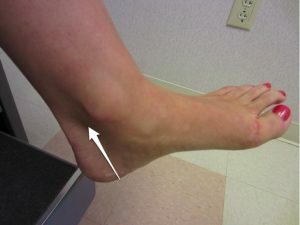 The FHL tendon can be a source of pain in the posterior part of the ankle (white arrow), behind the medial malleolus. us? This checklist can help you plan your next step to recover quickly and safely.